This is a beta test version map of the gamecube game The Legend of Zelda Wind Waker. 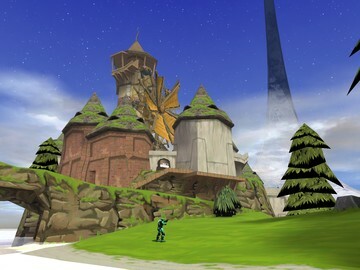 The location of the map in the game is called Windfall Island. There are two bases in this map. One is the Tetra's Pirate Ship aka Red base where the flag is near the steering wheel of the ship and another is inside the lighthouse (Blue flag location) aka Blue base. You can go inside the pirate ship by going through the portal there, as well as go to the top of the crow's nest of the ship. This was a beta test and still not 100% complete, so should be about 50% done. 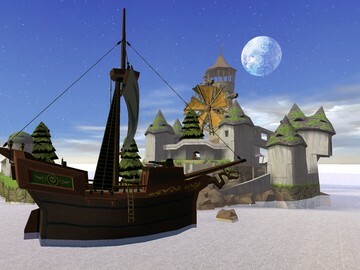 We still needed to add things like the white fence near the town, change the water, add wind waker sky, and others like fix errors from falling down the map when on weird surfaces and the textures on bushes and tree leaves. Gametypes like Slayer type, Capture The Flag, and King of the hill type should work fine. But others like Oddball and Race won't work due to the fact that the oddball doesn't spawn and Race nav points aren't there because we only made the beta testing for Slayer-like and CTF gametypes.